International Education Week 2018: "Addressing Global Insecurities"
In 2015, a United Nations report projected the world’s population would reach 9.7 billion people by the year 2050. Another UN 2016 report estimated that 108 million people suffer from severe food insecurity, a 35% jump over the year prior. Further exacerbating this problem is increased water scarcity, which affects four out of every 10 people. Issues of food and water insecurity transcend national borders as problems that affect all living organisms on planet Earth, making a global call for immediate action paramount. At the International Affairs Forum, engaged participants will discuss how using technology and building bridges across various communities of teachers, researchers, and businesses are key components to addressing global food and water insecurity. This half-day conference will provide a meaningful platform for international dialogue and will connect students with innovative faculty, researchers, and businesses who are seeking solutions to the most pressing problems of our time. Keynote address by Marty Kress, Executive Director of the Global Water Institute at Ohio State University. "How 21st Century Genetic Engineering Can Address Food Insecurity in the Global South"
"The Cowpea Story: From Lab to Our Dinner Plate"
"Global Food Security: Too Many People, Too Little Water?" 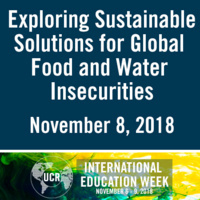 "UCR Food Recovery for R'Pantry"
About International Education Week 2018 Theme: "Addressing Global Insecurities"
Climate change, food and water insecurity, infectious diseases, technical knowledge and wealth inequalities, migration and conflict are complex issues that transcend national borders. Addressing these global issues takes creative problem-solving, collaboration, and innovation. International Affairs at UC Riverside will host a series of events that focus on innovative and sustainable solutions for addressing insecurities at the personal, campus, community and global levels. Please join us!